My copy of A Christmas Carol was a gift on Christmas day, 1963. Two Christmases ago I walked the cold, fog-laden, smog drenched streets of Old London with my dad whilst my mother visited with her family. It was a grey day and a grey week. We took turns warming parts of our body by fireplaces here and there. After five years in the U.S. we had returned home to London on the occasion of my maternal grandmother’s death. 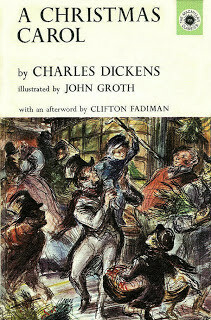 Dickens’ story paints a familiar tale textured by my early memories and enriched today by having watched my favourite rendition of A Christmas Carol (1984) with my wife on Christmas eve. My interest in reviewing the book is not just for a pleasant walk about the old streets of London but it’s motivated by a sense of appreciation for the poetic and colourful artistry with which Dickens plumbs the hopes and fears of humanity. So, following a quick summary, I’ll share my psychological take. We meet death and Ebeneezer Scrooge on page one. It’s Christmas time and we learn Scrooge’s old business partner, Jacob Marley, is as dead as a door nail. After revealing his humbug callousness toward the poor, Scrooge arrives home to meet the chain-dragging ghost of Marley who rattles the shackles of eternal punishment as he foretells the trinity of spirits that will anoint his Christmas Eve. As prophesied, the ghosts of Christmases past, present, and future pummel Scrooge until he cries out for mercy. Painful and evocative scenes of joyful and miserable characters offer perspectives that induce fear, terror, and eventually empathy. When the agony is past, Scrooge is reborn as an adult child overflowing with love and compassion. He is redeemed. Psychotherapy. Scrooge experienced intensive religiously oriented psychotherapy before Freud and his disciples examined the trinity of spirits engaged in perpetual conflict within troubled minds. Although the early ideas of the psychoanalysts no longer stimulate scientific inquiry, Dickens shares a narrative common to people with keen insights into the mental turmoil fueled by old memories and recent social interactions. Psychotherapists savour those moments when a patient discovers a new perspective—one that liberates them from their current pain and offers a view that energizes them for the tasks of life. The psychotherapist spirits expertly guide Ebeneezer through memories and scenarios on his way to a new formulation of life. Psychotherapists often suggest patients read books-- bibliotherapy. Evidence suggests many find reading helps resolve conflicts and find solutions to life's struggles. A Christmas Carol offers a rich look at the importance of friendships and the ability of people to make significant life changes. Dickens was also keenly aware of the social factors in life that make a difference. The story reminds us of Dickens' own poor childhood in Camden Town where his family went to debtor's prison. Poverty and lack of education (Ignorance and Want) have an effect on people's lives. Emotions. Psychological science has danced with emotions since its inception. Psychotherapists know the powerful forces of fear and anxiety that drive people away from life and into the cold, lonely, and risk adverse confines that ironically keep them from participating in a rich and exciting life. Dickens artfully illustrates the battle between the forces of anxiety and those of love. In the story, Dickens also portrays the development of empathy that matches reality. We often develop empathy when we can see a troublesome experience from the perspective of another. Empathy is a key to compassion. And empathy is stimulated by taking on another's perspective. Empathy also links to forgiveness and compassion. Forgiveness allows us to leave our past behind. We can learn to forgive parents and ourselves. Unfettered from the chains of the past, we can face the present with a fresh and compassionate view of others and ourselves. New perspectives can stimulate positive and negative emotions and can motivate behaviour. A Christmas Carol conveys the Christian gospel in a most entertaining manner. But Dickens also captures an essence that still informs contemporary inquiries into the Psychology of Religion. In the 1840s as now, people continue to negotiate the natural world by reference to their understanding of the spiritual. Religions may be considered as organized paths for pilgrims questing for a meaningful life. Saintly pilgrims reveal the joy of following the right path and attract followers along the way. They also embrace those whose life-crises provoke a re-examination of life and what life is all about. A Christmas Carol is indeed a narrative about the meaningful life. In any era, terror reigns in one part of the world or another. I’ve written about Terror Management Theory elsewhere so I won’t repeat the details here. Nevertheless, Dickens’ keen insight into the role of death as a pervasive source of anxiety that has predictable outcomes affecting faith and behavior, must be acknowledged. Suffice it to say, Ebeneezer was confronted by death in a frightful manner and the death-informed lessons changed his life. Dickens's insights are prescient and deserve to be recognized in that long line of thinkers like Kierkegaard, Otto Rank, and Ernest Becker preceding the formulation of Terror Management Theory. Dickens, C. (1843/1963). A Christmas carol. New York: Macmillan.